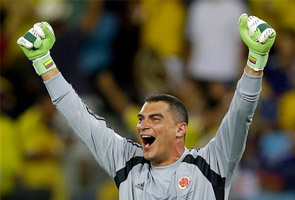 CUIABA: Colombia goalkeeper Faryd Mondragon became the oldest footballer ever to play in a World Cup on Tuesday, coming on in the last few minutes in a cameo appearance that sent the crowd into raptures. With his side leading 3-1 against Japan and virtually certain of their third straight victory in Group C, the veteran was introduced by coach Jose Pekerman in the 85th minute. Pekerman, whose side have hugely impressed in Brazil, praised the contribution of his reserve goalkeeper, saying he was delighted he could give him the chance to break the record. "Faryd has been a very important player for us," he said. "Since he joined the national team he has played a very important role in Colombia. "With Faryd we have a goalkeeper who has experience, who has already played at a World Cup and other players are pretty young so it's good that he can share his experience with those younger players. "Today we could give him the possibility to play a couple of minutes so that he can be recorded as the oldest goalkeeper at a World Cup," he said after his side's 4-1 win that saw them top the group. Mondragon, who plays his club football in Colombia, was the country's first-choice goalkeeper during the 1998 World Cup in France. He made his first international appearance in 1993. Man-of-the-match Jackson Martinez, who scored two goals, praised his team-mate, whose introduction was wildly popular among the hoards of Colombian fans in Cuiaba. "He's very happy. He's very, very happy. I think everything he has achieved until now shows that he deserves to be here," said Martinez. "He's experienced enough, is a good goalkeeper and is well equipped to defend our goal. I would like to congratulate him because I think it's been a great achievement for him."